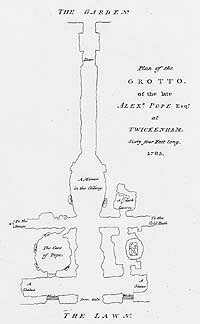 Alexander Pope moved to the rural setting of Twickenham in 1719, leasing three cottages on a small plot of land on the banks of the Thames beside a road now known as Cross Deep. Twickenham was becoming a fashionable retreat, being within easy reach of London by water or road. He set about building himself a villa in the Palladian style, facing the river. The riverside garden (his 'grassplot') was small and overlooked by nearby properties which included a malthouse, a wheelmaker's business, a bricklayer's yard and a tannery. Here he planted a weeping willow sapling which, although not shown on any view of the villa in his lifetime, acquired fame through association with the man later in the century. Pope also leased about 5 acres of unenclosed land across the road, which up to that time had been used for grazing cattle and for the production of food. He started to create a garden based on the pastoral and landscape gardening ideas he had formed. Pope's Villa was separated from his main garden by the road and in October 1720 he obtained a licence to construct a tunnel under the road to connect the two. The tunnel led out of the basement of the villa where, in the central section, Pope made his first grotto. "I have put the last hand to my works... happily finishing the subterraneous Way and Grotto: I then found a spring of the clearest water, which falls in a perpetual Rill, that echoes thru' the Cavern day and night. ...When you shut the Doors of this Grotto, it becomes on the instant, from a luminous Room, a Camera Obscura, on the walls of which all the objects of the River, Hills, Woods, and Boats, are forming a moving Picture... And when you have a mind to light it up, it affords you a very different Scene: it is finished with Shells interspersed with Pieces of Looking-glass in angular Forms... at which when a Lamp ...is hung in the Middle, a thousand pointed Rays glitter and are reflected over the place." The tunnel acquired decoration, so forming an extension to the grotto itself. 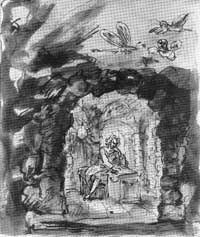 Dr Johnson, wrote a mocking but inaccurate description: "A grotto is not often the wish or pleasure of an Englishman, who has more frequent need to solicit rather than exclude the sun, but Pope's excavation was requisite as an entrance to his garden, and, as some men try to be proud of their defects, he extracted an ornament from an inconvenience, and vanity produced a grotto where necessity enforced a passage". Following the break-up of their friendship Lady Mary Wortley Montague was even more derisive: Here chose the goddess her belov'd retreat, Which Phoebus tries in vain to penetrate, Adorn'd within with shells of small expense, (Emblems of tinsel Rhyme and triffleing sense) Perpetual fogs enclose the sacred Cave; The neighbouring sinks their fragrant odours gave. In 1739, inspired by a visit to the Hotwell Spa at the base of the Avon Gorge he developed an interest in geology and mining and, over the next four years transformed his grotto, decorating it with ores, spars, mundic, stalactites, crystals, Bristol and Cornish diamonds, marbles, alabaster, snakestones and spongestone. Much of this material was sent from Cornwall by Dr William Borlase. Other material came from all over the country and abroad, given by friends, acquaintances and those who wished to be known to him. 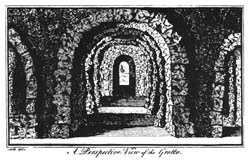 Serle described a 'fine and very uncommon petrifaction from Okey Hole in Somersetshire' in the corner of the corridor and staircase leading out of the grotto and up to the villa. It has long been claimed at Wookey Hole, near Wells, that Pope, on a visit, hired the local militia to shoot stalactites from the roof of the Witches Cavern. However, there is no record that Pope ever visited Wookey Hole. The 'petrifaction' was a stalagmite, growing up from the floor. It was one of a number cut off by a local resident and presented to collectors around the country. The stumps, slowly re-growing, can be seen today. This story, myth embroidered by defamatory invention, continues to be propagated locally although an official 'pardon' was issued some years ago by the owners of the cavern. The stalagmite is no longer to be found having, probably, long been removed to somebody else's collection. 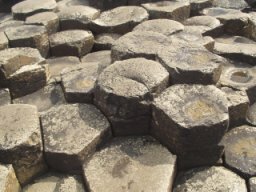 What can be seen today is a small "joint" of basalt from the Giant's Causeway in County Antrim, Northern Ireland, one of two presented to Pope by Sir Hans Sloane. It is on the left hand side of the central chamber at low level near the entrance. The second piece has yet to be found. The villa was demolished in 1808, being replaced by a new house and then a further one built in 1845. Happily, much of the Grotto survives and lies beneath various 20th century buildings owned by Radnor House School. For many, the Grotto represents the idea of art imitating nature and is seen as a symbol reflecting Pope's life and development as a poet. At present the grotto can only be visited by members of the public during monthly openings, the Twickenham Festival in June and Open House London in September each year or by special arrangement. Dates and booking procedures for visits Can be found on the Pope's Grotto Preservation Trust's website.